Phillies outfielder Rhys Hoskins is one of just 44 players in baseball to have six two-strike homers this season. A few weeks before he leaves home each year for spring training, Rhys Hoskins retreats to a Northern California batting cage and silences his music to make the room as quiet as possible. The only noise he hears is that sweet sound of contact. And then he raises the volume on the sound system, "bumping the music" as loud as it will go, Hoskins said. The batting cage becomes anything but tranquil, and Hoskins tries to keep his mind from being overtaken by the noise as he takes his cuts. The 25-year-old outfielder is revered for his sharp mind at the plate, never seeming to lose focus no matter how tense the situation becomes or how long the at-bat drags on. There is no way to replicate the in-game distractions faced throughout a season, Hoskins said. But shaking the room with music is a good way to try. "I like to see what I can do to maintain that focus," Hoskins said. "That focus" allowed Hoskins to average the most pitches per plate appearance in the majors during the first half of the season. And that focus allows him to turn those long at-bats into success. The more a pitcher throws, Hoskins often says, the more likely the pitcher will make a mistake. But it could also be said that the longer an at-bat lasts, the more likely a batter could fade out or give in. Not Hoskins. If there was ever a time for Hoskins to check out, it was last month in the fifth inning of a blowout loss to the Nationals. The Phillies were already down nine runs, and there was hardly a chance that Hoskins' at-bat would change the outcome of a bland Friday night. But Hoskins stayed focused. He fell behind 1-2 against Washington righthander Erick Fedde before working the count full after six pitches. Then he fouled off seven consecutive pitches. Hoskins has fouled off 17.3 percent of the pitches he's seen this season, the second-highest rate among all Phillies. "I think it's like the more he's fouling pitches off, the more we're like, 'OK. Here comes something cool,' " catcher Andrew Knapp said. "There's only a couple guys in baseball who can put together at-bats like that. He doesn't ever lose his confidence in himself to have control of the strike zone. He never forces himself to swing. He makes the pitcher give him something to hit by being able to ruin a lot of really good pitches to continue the at-bat. He's stronger the longer the at-bat goes." Knapp was right: Something cool was coming as Hoskins battled. He ripped Fedde's 14th pitch, a grooved splitter, and hammered it over the center-field wall for a two-run homer. Fedde finally made a mistake, and Hoskins was ready for it. He never lost his focus even though the at-bat lasted a few minutes. “I guess I’m lucky that I’ve had some success in long at-bats already,” Hoskins says. That homer off Fedde was one of Hoskins' team-high six home runs this season that have come with two strikes. He is one of just 44 players in baseball to have six two-strike homers. He ended the first half with 37 hits in 133 at-bats after returning from the disabled list. And 19 of those 37 hits came with two strikes. Just six batters had more two-strike hits over that stretch. "It's one thing when you're Cesar Hernandez and you're leading off the inning or you're leading off the game and you know that getting to two strikes and battling back is kind of optimal for the dugout and for your team," manager Gabe Kapler said. 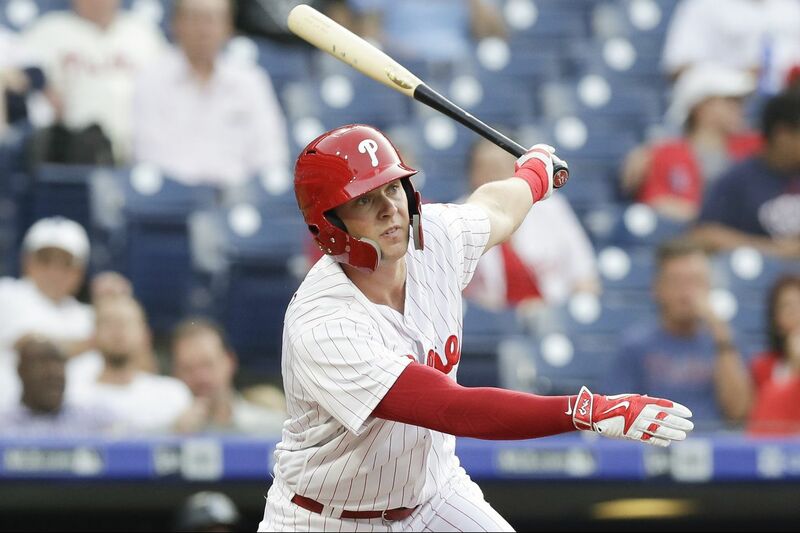 "It's another thing when you're Rhys Hoskins, and to be the home-run guy and be that comfortable getting to that point and then fouling off pitches. "I think it's one of his strengths, and it says a lot about his concentration level and his determination and fight in the batter's box. We're always yelling from the dugout, 'Hey, fight now. Hey, battle now. Get in there with him, now.' That's the message to our guys. When you go down 0-2, when you go down 1-2, see one more pitch and get back into the count, climb back in. And Rhys can climb back in with the best of them." Hoskins climbed back in against Fedde by staying focused. Hoskins reminded himself to stay stubborn as the at-bat dragged on. He tried to guess what Fedde would throw — "There's no way he's going to throw you another sinker," his inner voice said — and then Hoskins simply fouled off a pitch when he guessed wrong. It was as if Hoskins was back in that batting cage with the music rocking. It would have been easy to cloud his mind, drift away, and zone out. Instead, he stayed sharp and waited for that mistake. "Am I as good at it as I hope to be? No," Hoskins said. "But the experience is going to come with more long at-bats and big situations. Those are coming. You learn from those as you go. I guess I'm lucky that I've had some success in long at-bats already. I know I can do it. I'm becoming more confident in those situations. It's good."